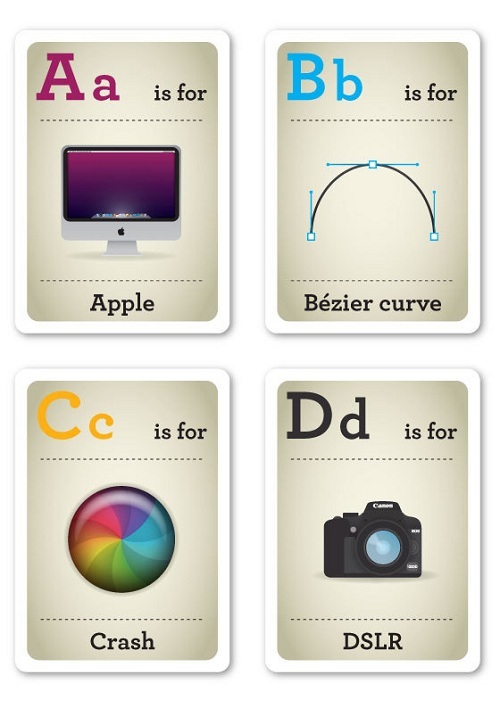 These culturally relevant flash cards make me realize that when I say the words “A is for apple,” I picture a computer in my head! They are all so true, aren’t they? Especially for those of you who may spend a good part of your day working on a computer. C, tragically, is for an unexpected and always untimely crash. E is for an overflowing inbox. 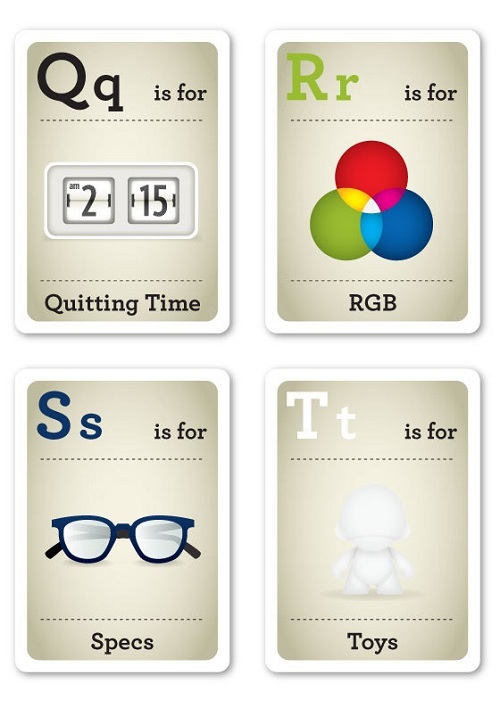 And Q, as all parents know, is for a quitting time that never really comes! Designed by illustrator Emma Cook, via Behance. 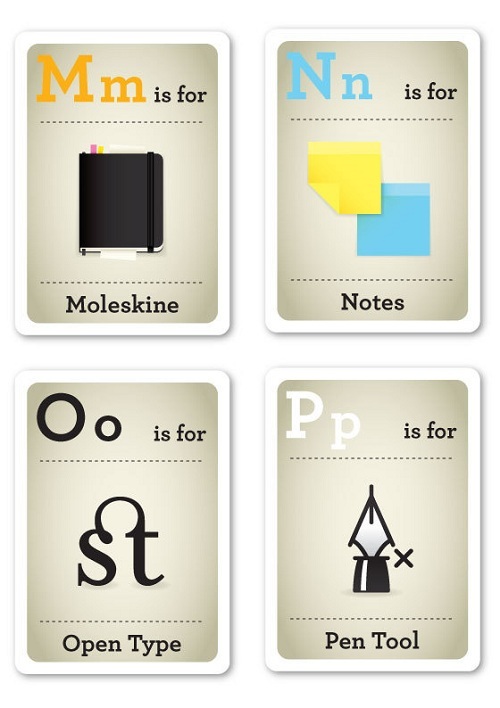 M is for Moleskine is my favorite. Ever since they came out with their passions series I know do all my baby books, recipe books, journaling, on Moleskines. Since I carry a Moleskine with me everywhere I go…I have to say M. Very cute. Hilarious. And oh so true! Loved them, but – good gracious, I am even more old-school than I thought I was. I didn’t even know what a bunch of them were! Thank goodness my grade 4 students are both patient with me and well-versed in techie things. If it were my house the R would have been Rotary Dial Phone! I do mirror the Moleskine sentiment, however. Gabrielle, thanks for sharing this great find. My hubby and I are both IT managers in our day jobs and these made me chuckle. Sadly, I laughed at some because they are true sometimes, like the overflowing email box and the real quitting time. I think these would make a great present framed for my husband as office decor! So cute!! I love Layer and interwebz!! 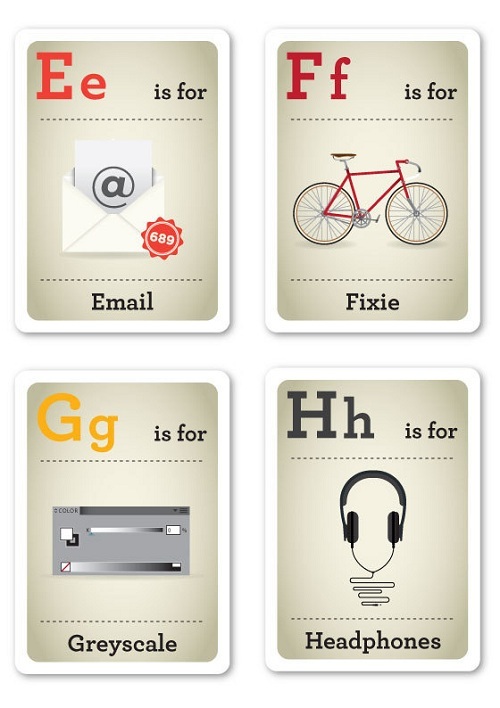 On a related note, have you seen the gorgeous Animal Alphabet postcards on Kickstarter? I’ve ordered a set and plan to send them to my nephew and niece, one postcard a week all winter. Ahh, these are brilliant! I’m going with B as my favorite. Been designing logos the last couple days. Only fitting. PS—I didn’t get a chance to meet you at Alt but your presence was so warm and welcoming. Thanks for that! 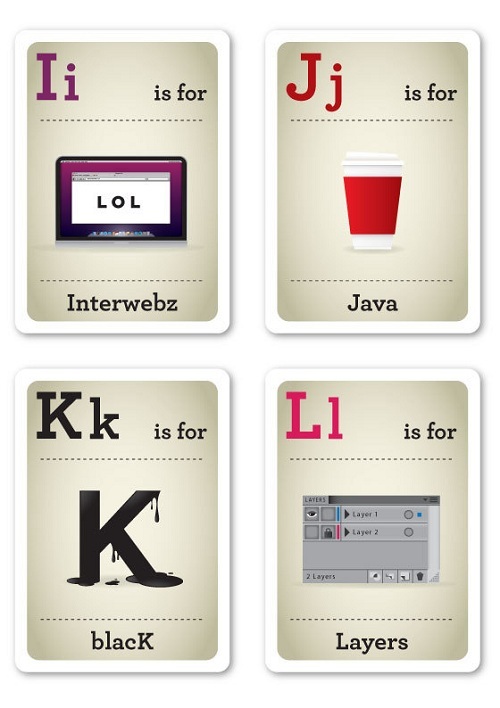 I love clever K. And layers! Things I have used very often. Thanks for sharing! I had to show all my design friends! my husband would love these! And I laughed at the 2:15 for quitting time. That would be nice, wouldn’t it! I laughed when I saw that “C is for Crash”. I get so sick of seeing that spinning ball. Lol.